This detached ground floor cottage is located close to the village of Doulting and can sleep four people in one bedroom. The Granary is a single-storey, detached cottage close to the village of Doulting, just three miles from Shepton Mallet. The cottage sleeps four people and has one double bedroom with two single folding beds available, and a family bathroom. 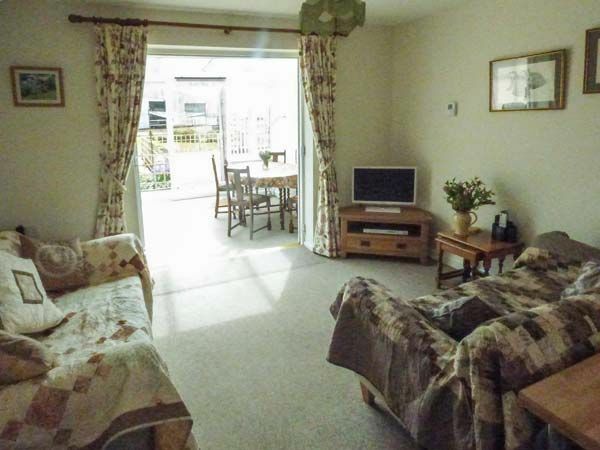 Also in the cottage is a kitchen and a sitting room along with a conservatory with dining area and sitting area. Outside is off road parking for one car and a patio with furniture. Situated in a rural location, The Granary is a romantic base from which to explore the rest of this lovely countryside. Amenities: Oil central heating. Electric oven and hob,microwave, fridge/freezer, washing machine, dishwasher, 2 x TVs with Freeview, DVD, WiFi, selection of books and games. Fuel and power inc. in rent. Bed linen and towels inc. in rent. High/low chair and travel cot on request. Off road parking for 2 cars. Enclosed patio with furniture. Two well-behaved dogs welcome. Sorry, no smoking. Shop 3 miles, pub 1.8 miles. Note: Suitable for guests with limited mobility with wider doorways, level access and support rail on WC. Note: This is a working dairy farm with the farmyard close to the garden, there are likely to be associated smells and sounds. Note: Farm tours may be available by arrangement with the owner. Note: Dogs to be kept on lead outdoors. Town: The historic town of Shepton Mallet is a delightful mixture of 'old and new', with some wonderful old architecture and a weekly market, plus a variety of shops, pubs and eateries. Shepton Mallet is set in the Mendip foothills, and is at the geographical heart of the Mendip District. This is a beautiful landscape, with unique places to visit and activities for everyone. Shepton Mallet is home to the Royal Bath and West Showground; one of Britain's major agricultural shows is held here annually in May/June, and many other events are staged throughout the year. Oil central heating. Electric oven and hob,microwave, fridge/freezer, washing machine, dishwasher, 2 x TVs with Freeview, DVD, WiFi, selection of books and games. Fuel and power inc. in rent. Bed linen and towels inc. in rent. High/low chair and travel cot on request. Off road parking for 2 cars. Enclosed patio with furniture. Two well-behaved dogs welcome. Sorry, no smoking. Shop 3 miles, pub 1.8 miles. Note: Suitable for guests with limited mobility with wider doorways, level access and support rail on WC. Note: This is a working dairy farm with the farmyard close to the garden, there are likely to be associated smells and sounds. Note: Farm tours may be available by arrangement with the owner. Note: Dogs to be kept on lead outdoors. Could not be better. We stayed for 4 nights with our 2 young children and dog. The bedroom is roomy with a large double bed, very comfortable and with excellent bed linen, duvet and pillows. The kids were on fold up beds in the conservatory area. They were proper sprung fold up single beds that were also very comfortable and there was plenty of room. The whole place was lovely and clean and bigger than expected. We had a couple of cold days and needed the central heating, the place heats up very quickly so it would be good for a winter break too. It was nice that things were put in such as washing up liquid, cloths, dishwasher tablets, plenty of toilet rolls etc. The patio area was fully enclosed, great for the children, right next to the chickens (very fresh eggs for breakfast) and with a view of the cows, it was lovely. Rebecca was extremely welcoming, a great relaxed host and very helpful when needed. We arrived to an amazing a chocolate brownie! The area was great, near to Longleat, Cheddar Gorge, Wookey Hole, some lovely towns and walks etc. I highly recommend this cottage.